The first tier of universal management consists of three executive heads: Brahma, Vishnu, and Shiva. 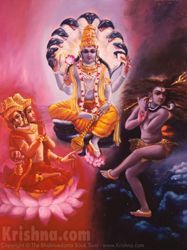 Each is such a powerful controller that they are sometimes given equal status within Vedic literature—and inaccurately called “the Hindu Trinity” by Western scholars. The Srimad-Bhagavatam explains that Vishnu is God, or a full expansion of Krishna, whereas Brahma is a finite soul, and Shiva is in a category of his own, slightly less than God. Both Brahma and Shiva are servants of Vishnu, empowered by Him for universal work. Working under these powerful controllers are many demigods, or devas, empowered to fulfill universal duties. As departments within a city government manage the delivery of water and electricity, the devas oversee the material world. We should not mistakenly worship the devas as God. We are indebted to them, but they supply life's necessities on God’s behalf using His energies, and we can pay our debt to them by worshiping Him. By satisfying Krishna, all His servants are satisfied.